I really haven't even meant to wear dresses as tops so often this summer, but you won't see me complaining. I have an abundance of dresses and a pretty decent collection of skirts, but my closet is seriously lacking in the shirt department. Seeing as my cash flow isn't that great at the moment (how great are unpaid internships and cellphone/car bills, am I right? ), I have to improvise for the time being. Fortunately, the dresses as tops thing is kind of my specialty. 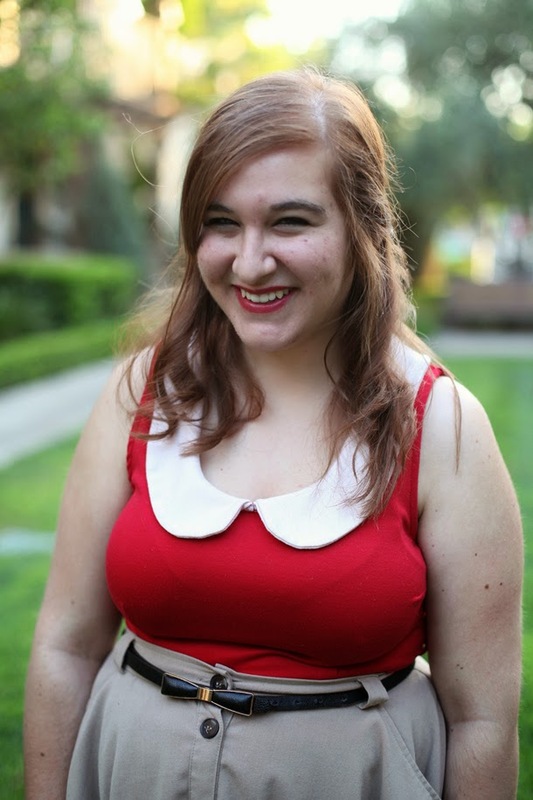 This red Modcloth dress is still one of my favorite pieces that I own, and it's just so versatile. It paired perfectly with this skirt, another thrift find from a couple of weekends ago. I can already tell I'll get a ton of use of this skirt seeing is it's a wonderful silhouette and an easy color to pair with anything. Versatile, easy pieces for summer are my jam. I wore this the Friday before last to spend time with my brother, sister-in-law, and nephew. Leaving my family in Illinois (another brother, sister-in-law, two nieces, and a nephew) was seriously tough in May, and while I miss all of them like crazy, it's been really nice to get to spend time with my family here now. We'll all be going out to dinner this weekend for my birthday (which is next Thursday), and I'm pretty pumped to celebrate. I mean, I'm mostly excited to get to go to Disneyland on my actual birthday since I haven't been in a year and a half (despite living in the same city), but I'd say that's pretty understandable. The night I wore this, I also hung out with my friend to watch The Wire, and I'm happy to report that I FINALLY finished the series. I probably started it about three years ago and having been watching it on and off since then. It's an amazing show, but it moves a little slowly and it definitely requires full attention to really appreciate it, so I've always taken breaks to watch other things. I can't even pretend like finishing it isn't something I'm really proud of, because this is a big moment for me. This means I can now be that person who makes everyone else feel bad that they haven't watched The Wire. You know the ones. So everyone in my life can look forward to that from now on. What a cute outfit! That skirt definitely is a staple piece and I just love it with that belt so much. 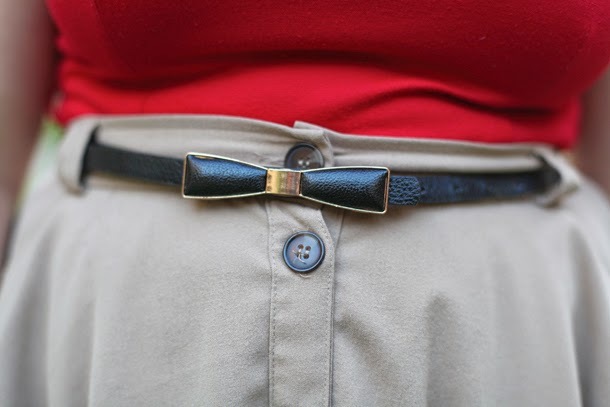 I have a thing for bow belts. I really need to try a dress as a top with a skirt, I feel like I don't have skirts that would work that though, Im gonna look next time Im in a thrift store though! Have fun at Disney for your birthday, and also happy birthday! I love you in red! That skirt is so cute and you are a master of dresses as shirts- I still have never tried! I hope your birthday next week is awesome. I wish I could go to Disneyland for mine! Dresses as tops is pretty much genius. Gives a whole section of your wardrobe double duty. It works. I like it. This outfit is full of amazing little details. The shoes were a great pick too. You are a cutie. And Disneyland for a birthday sounds fantastic! Omg I'm excited for you for your Disney trip! And I am never not into that dress. I love the bright red dress with the neutral skirt- perfect combo! Most my tops are thrifted because for some reason I always feel like new shirts are always more expensive than they should be :) Let the birthday celebrations begin!!! Anyway, love the adorable dress as a top and your belted skirt on it. You are so frigging cuteeeeeee! Dresses as tops are great!! I don't own many skirts so I haven't tried it but I'll have to remember that trick now that I have a few! Hahah congrats on finishing The Wire- now you can finally climb onto your high horse and tell everyone what they're missing ;) And seriously love that dress on you- and that peter pan collar makes it into a n equally amazing top! This look is super gorgeous. The silhouette of that skirt is very pretty. 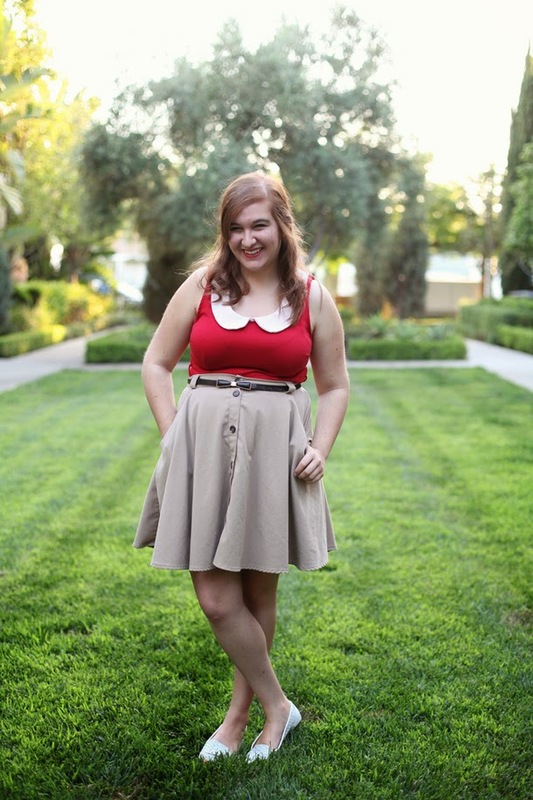 And ahh the peter pan collar is very adorable! This is so adorable! I love your style! This outfit is so adorable, I'm obsessed!! 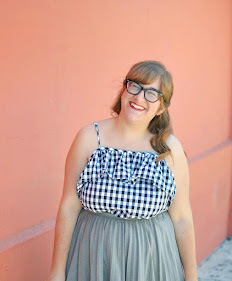 I love the dress you chose to use as a top, and the skirt and belt you chose to pair with it are so adorable! Oh my! I love this outfir... it looks great on you. 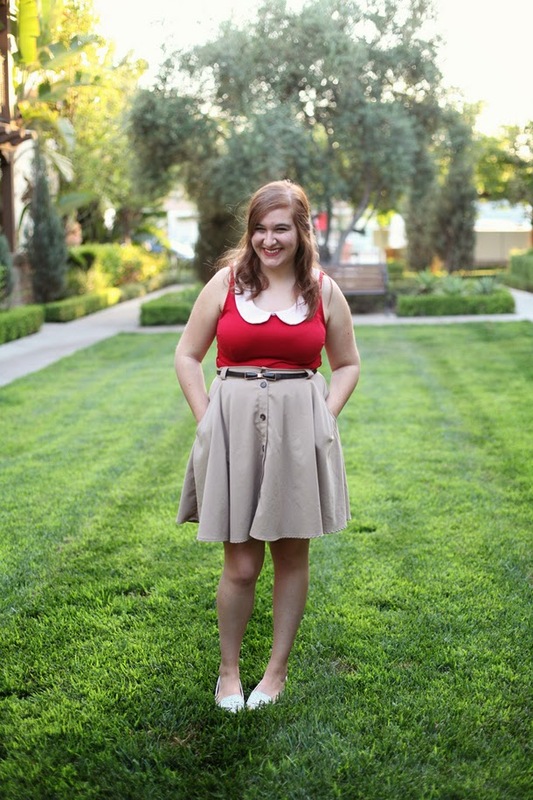 Red is your color for sure and the skirt is adorable. I love it all! Finishing a series or getting caught up is totally an awesome feeling and accomplishment. I love how you used that dress as a top, too cute!